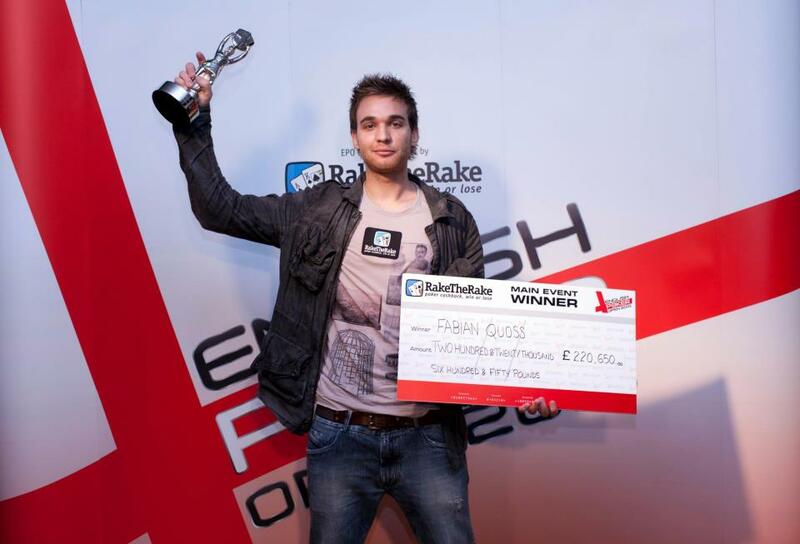 RakeTheRake is proud to announce that it will be once again sponsoring the prestigious English Poker Open in September this year. The EPO2012 runs from September 18th – 21st at the Fox Poker Club in London’s buzzing West End and offers a guaranteed £250,000 prize pool. The EPO, launched in 2009, is one of the freshest and most exciting poker tournaments in Europe. And in a year when the UK, especially England, is attracting the world’s attention with events celebrating both sports and royalty, could there be a more exciting place to be playing live poker? Previously attracting over 200 players and generating a prize pool of $1 million dollars+ the English Poker Open offers an exhilarating tournament experience with the potential for great rewards! Want to take the EPO title from reigning champion Fabian Quoss? For the latest event and registration information visit www.EnglishPokerOpen.com, LIKE ‘English Poker Open‘ on Facebook, or follow ‘EPOlive’ on Twitter.